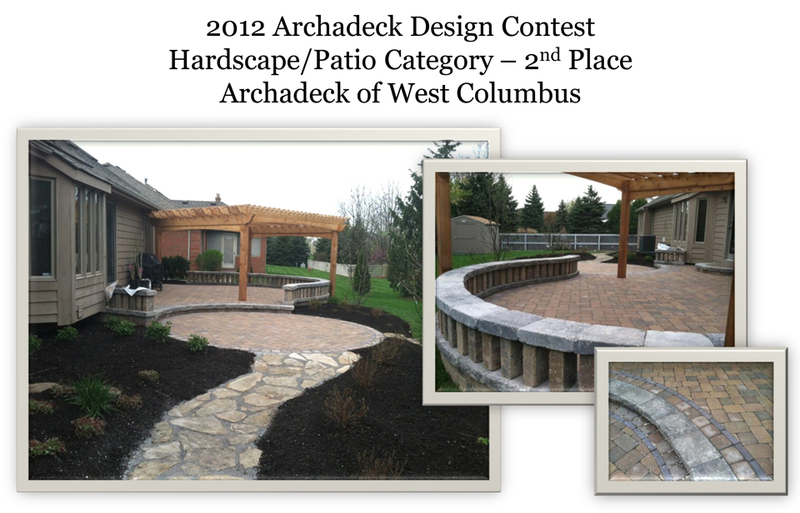 Archadeck of Columbus explores the reason it is hard not to fall in love with a patio, or hardscape structure for your Columbus backyard. Much more is involved in creating a beautiful paver patio than just carving out a niche in your landscape and filling it with sand and pavers. There is a common misconception among many homeowners that choosing a hardscape outdoor structure is a last resort after considering other more “traditional” outdoor spaces. This may be influenced by the shape of your lot, or even the elevation, neither of which are true. Today’s hardscapes offer an aesthetic you just don’t get with a deck or porch. Choosing a hardscape as a stand-alone outdoor space or as part of an outdoor living combination structure adds depth and texture to your backyard. Hardscapes are versatile and beautiful in their own rite and our hardscape designs begin as meticulously planned designs that contain as much thought and consideration as our other outdoor structures. You have to always take into consideration a patio is part of your yard whereas decks and porches are generally connected in some way to your existing home. Many patios are set at grade level and have no step down to the yard. This concept opens up a world of possibilities for many backyards that otherwise could not facilitate the addition of a deck or porch. A quality hardscape outdoor space can enable homeowners to open the back door and enter directly into their outdoor space with little or no transition. 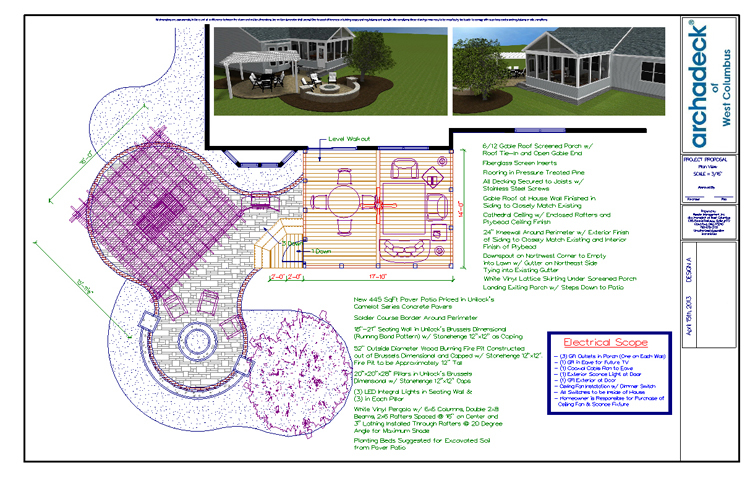 Here is an example of our detailed hardscape patio design plan. Patios are also considered low-maintenance which is often an overlooked benefit of owning a hardscape. Patios are easy to maintain and only require a quick sweep of leaves or debris to clean. If something happens to one paver, it can be removed and replaced without disrupting the structure around it. 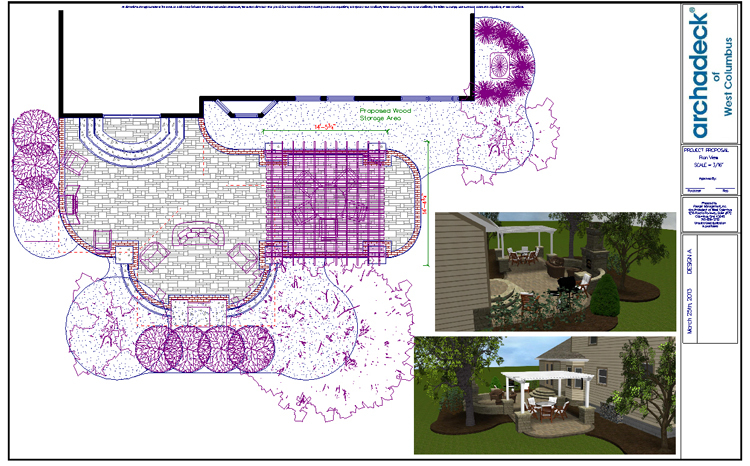 Another Columbus paver patio hardscape design. The most important consideration when choosing a hardscape patio or other hardscape outdoor space is function. Hardscape designs can offer abundant dining space, seating space and grilling space all working in unison to mimic the feel of a porch or other outdoor room. Some homeowners are choosing to replace old solid concrete slab patios and wood decks with pavers since they do not crack like the slabs do. Data indicates that patios are a solid investment. 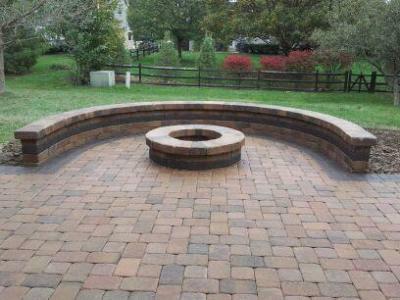 The curved seating wall and firepit is a great way to add vertical dimension to this patio in Columbus, OH. When we meet with homeowners considering a hardscape addition for a design consultation, we carefully mold a plan with their vision of the perfect hardscape patio. We then plan for the amount of space needed to accommodate those needs. Archadeck of Columbus prepares a detailed 3-dimesnonal rendering of your anticipated hardscape outdoor living space so you will be able to visualize every detail of the plan. Please visit our patio and hardscape photo gallery and out outdoor fireplace and fire pit photo gallery located on our website for more hardscape ideas for your backyard! Previous Previous post: How can you truly evaluate price quotes when comparing estimates when there is more involved than just the bottom line? Next Next post: Archadeck of Columbus gives our review of TimberTech Evolutions – 2 thumbs up! !